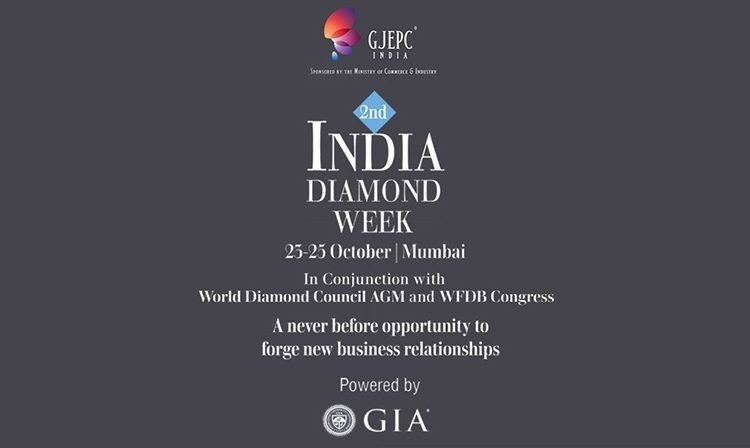 GJEPC to organize 2nd edition of India Diamond Week at Mumbai in October.A fter the phenomenal success of its first edition and increasing demand from the buyers as well as sellers, GJEPC is all set to organize the 2nd edition of India Diamond Week in Mumbai from 23 – 25 October 2018. This year, India Diamond Week will be held on the sidelines of World Diamond Council’s AGM and World Federation of Diamond Bourses’ Meet at Mumbai. Mr Pramod Agrawal, Chairman, GJEPCsaid,“This Diamond Week is distinct, as it would witness key stakeholders of the Global Diamond trade this year with GJEPC hosting the World Diamond Council’s AGM in Mumbai around the same time. This format of Buyer Seller Meet provides immense opportunity to discuss business face to face, and strengthen trade ties with buyers. We are overwhelmed with the response in this edition with over 100 buyers confirmed to visit Mumbai for the Diamond Week from all major key diamond markets of the world including the USA, China, Hong Kong, Israel, Russia, Europe, South Africa, Turkey, Middle East, Iran, Latin America, Australia, New Zealand, Indonesia, & South Korea”. “Today India plays a pioneering role in the development of value-added diamond cutting, with the sector cutting and polishing 14 out of 15 diamonds set in jewellery worldwide. India brings diamonds to life – every size from the smallest to the largest. 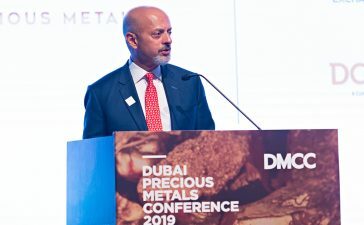 After creating a niche for itself in the diamond world with small diamonds, India has also developed a skillset for cutting and polishing larger stones and fancy cuts.” Mr Pramod Agrawal added. The gem & jewellery exports accounted for USD 41 billion in 2017-18. The growth in the sector was primarily driven by the Cut & Polished Diamonds (CPD) segment, which witnessed an increase of 4.17%. The export sales of CPD grew to USD 23732.96 million during FY 2017-18 from USD 22,783.85 million in the corresponding period in FY 2016-17. Mr Colin Shah, Vice Chairman, GJEPC said, “Indian Diamond Industry is labour intensive and employs 2 million workforces in the diamond sector alone. Value addition is the key focus for the industry. Indian Diamond trade is committed to four pillar principles of fair trade. One, it leads in self-regulation encouraged through My KYC amongst GJEPC members. Two, sustainable development, created through model programs for the health and welfare of its workers such as SwasthyaRatna. Three, it plays a dominant role in global diamond advertising. Four, it is building state-of-the-art gemological laboratories that ensure diamonds are natural, well-crafted and ethically sourced. The first two days of the event will have a pre-fixed one-2-one meeting of approximately 30 minutes between the buyer and seller, and the 3rd day would be an open exhibition. There are around 40 manufacturers/exhibitors participating at the event. Some of the confirmed companies for the event include Amrut Gems, Anand International, Asian Star, Dirgh Diamond Pvt. Ltd., Dharmanandan Diamond Pvt. Ltd., D Navinchandra Exports, Dimexon Diamonds Ltd., Hari Krishana Exports Pvt. Ltd., J. B. and Brothers Pvt. Ltd., Janam Corporation Pvt. Ltd., J K Star, K P Sanghvi & Sons LLP, Karp Impex Ltd., Kiran Gems Pvt. Ltd., K. Girdharlal, Kumbh Gems Mahendra Brothers Exports Pvt. Ltd., Mahima Gems, Mithal Mfg. Co., Narola Gems, Nikita Diamonds, Parishi Diamond, Param Exports, PopatlalNathalal Shah, Rosy Blue, Shree Ramkrishna Exports, S. Vinodkumar Diamonds Pvt. Ltd., Sanghvi & Sons, Sheel Gems, Sheetal Manufacturing Co. Pvt. 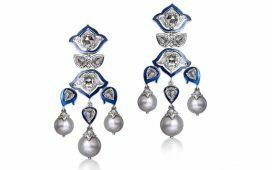 Ltd., Shivam Jewels, Star Rays, Samarth Diamond, Tanvirkumar& Company, Unique Gems, Vaibhav Gems, Veer Gems, VishindasHolaram, VD Global, and Yamuna Enterprise.